The history of the ZPH Zolwro- Baumeister Sp.zo.o. He reaches 1980 the year when the Stanislaus and Zdzislaw Olejnik on the surface 150 m2 in Wroclaw started producing a trowel and putty paint. And so, with the passage of time through a period of transition until the beginning of the new century rolled ,modernized and expanded the range of tools for construction. In the year 2003 a change in the form of conducting BUSINESS from a physical to a company zoo. 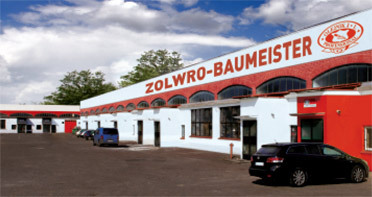 With immediate Extensions among the shareholders on the shareholders of Austrian , who on the basis of its more than a century of experience in the manufacture of hand tools help maintain the performance of the products Zolwro at the highest level. In the meantime spłka acquired a property in Oleśnica (30 km from Wroclaw ) where 2500 m2 of production and warehouse produces and market the articles masonry,Plastering and painting. At the moment exercised by the tools we get to close 20 m.in countries. Russia ,USA ,Austria. Of course do not forget about the domestic market and through a network of distributors and regional oglnopolskich branded supply tools OLEJNIK JL. PROFFESIONALL to all corners of Polish.